So many experts today provide financial advice, I didn't know where to begin our lesson. Have you ever paid with a credit card because your cash was floating in a layer of crumpled receipts, disposable diapers, and school papers? Now we use Dave Ramsey's no credit method--we pay cash for our daily purchases. Spending cash registers in your brain in a way that swiping plastic does not. I think Dave would be pleased that I bought his Financial Peace envelope system at a yard sale! Before that, I used free money envelopes from our bank. We withdraw cash and sort it into envelopes for groceries, entertainment, car, clothing and so on. When the envelope is empty, the spending is done. Leftover money adds to the next month's total. Two exceptions: we pay bills online (no stamps), and I pay at the gas pump with a debit card. Change goes into a coin purse for yard sales, perhaps the only place left where a quarter can buy something of value! Smart Card and other discount cards from the Farm Bureau, etc. A watch lets me know when I'm taking too long--extra minutes mean extra money spent! My grocery list is always based on what's on sale that week. I read the grocery ads online and plan my menu from the ads--not the other way around. I only buy groceries on sale, and if possible, buy enough to last until the next sale. My simple coupon file holds the "best deal" coupons of the week I clip according to the Coupon Mom's Cut Out Hunger site. Her FREE online chart helps you figure out which coupons to cut for each week's grocery ads. Today's assignment: organize your handbag--and organize your budget! If your money is out of control, take a week and write down every penny you spend. Meredith, what great ideas. Simple, yet I don't think about my purse in that way. I will reorganize my purse immediately. 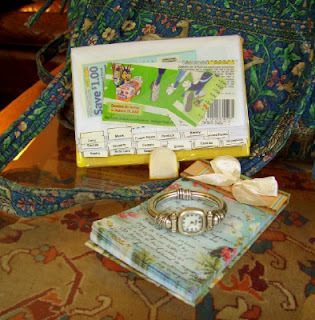 Do you keep a price book in purse, too? I used to, Mary. Then I downsized to an index card with my "target price points" on the grocery items I buy most often. Many women are able to condense the price book, grocery list, grocery ads, and receipts on a PDA or Smart Phone, too. Thanks for bringing up that omission. Meredith, that was a great post! Excellent post today, Meredith! You keep up the good work. You are inspiring women more than you could possibly know! You have inspired me! I need to reorganize my purse now! I have a question, though. How long does it take you to figure out the sales and coupons and shop with them? I have tried that before, but it takes me SOOOOO long to get organized and plan, that I get discouraged. Any tips? I have tried just about every coupon technique there is. Coupon Mom's system is the most streamlined, most time effective that I've found so far. She has already compiled the list of sale prices for the week and matched the prices to the coupons over the last few weeks! AT NO COST TO YOU--unlike the Grocery Game or other subscription sites. You don't even cut out all the individual coupons. Just collect the inserts week after week. Look at Coupon Mom once a week. If there is a deal you like on her chart, she tells you which coupon in which insert to clip. For more information, Coupon Mom has a book out now which is probably at your library. I will include that in the bibliography at the end of the week. What is the farm bureau? 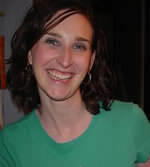 I found your site via Sherry at Redbud's Lane and I like what I have read. What great tips, encouragement, and inspiration to wives of all ages. I love the idea of keeping a wish list and ruler as I am always at thrift stores. Thanks for sharing. I'm also using the Dave Ramsey system, and it really helps keep me on budget. Another great post! Thanks for all these tips. My purse is usually a jumble, but with your help, I'm going to try to get it organized tomorrow. Jora, the Farm Bureau is an insurance agency here in the South. You get additional discounts with your membership card--similar to AAA discounts, etc. I can always tell when my life is getting too crazy by the amount of junk in my purse. I do slip and use my debit card sometimes, but never the credit. Getting to the bank for cash is the hardest part of this system for me. I'm glad to see so many other Dave Ramsey fans here! He really makes it simple. Hi Meredith! This is such a great post! I'm wondering if sometime in the future you could give a quick primer on how you use Quicken to manage your receipts and spending. I have a huge pile of receipts that I save from grocery shopping, and would like a neater way to track this. Your posts are so informative and beautifully composed--you are a model for all homemakers! I love Dave Ramsey's system as well. My husband and I led a Financial Peace University at our church this past spring. If I weren't having a baby in the next couple of weeks, we'd be doing it again in the fall. He's the best financial guy out there! I think he would be impressed with how you manage your money. We're still working on streamlining, but we are cash only as well. Thanks for the great advice you've given us this week so far. 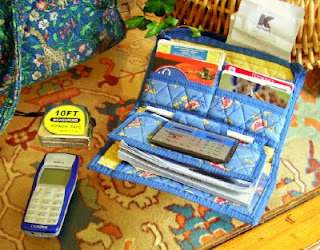 Meredith Dear, I must ask where you purchased that lovely blue floral fabric wallet. Way too pretty and might just be the inspiration I need to stay organized. Thanks for sharing about organizing your handbag. I've tried a lot of different systems for organizing mine and am still trying to distill everything down to the essentials. My mother in law is a seamstress and always has her tape measure with her. I've been surprised at how often we've used it when shopping together. I was glancing at some picture frames at Old Time Pottery in Memphis and needed a specific size. Out came the tape measure. I need to put a small one in my purse, as well. Some time, will you share what you put on your price points card. 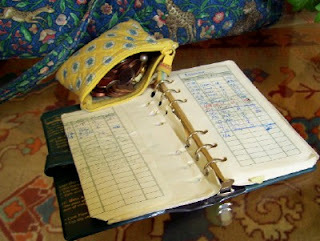 I started keeping a price book, but found it cumbersome to keep and to carry. Yet, I need some way to compare prices. The index card with target prices on it is such a fabulous idea! I'm looking forward to the rest of the posts! I'm wondering too where I can pick up a cute wallet like yours. PLEASE!!! Sorry, friends, I bought mine at a yard sale (of course)! It is a Vera Bradley wallet, and you can find them cheapest on Ebay unless you happen to stumble upon a $1 deal like mine. The coin purse and diaper bag are Vera Bradley, too. The quilted fabric bag is not chic, but it seems to be the style in my corner of the world. I only started picking them up after I saw how expensive they are in boutiques. Try to find a gift shop that carries the full line for comparison. I was reading that you buy your tracfone minutes on ebay. Is it really cheaper than going to their website? Do you have a trusted seller on ebay that you frequent? I love what you're doing and you are blogging about it with such great style! We have just started with Dave Ramsey and the envelope system. I never thought I could do it or that my husband would go along with it, but here we are, doing well in our first month. I am hoping that this changes us forever. Right now it sure feels like the right thing to do.